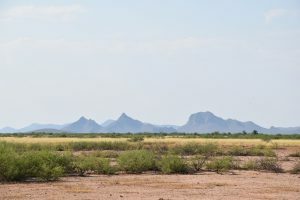 The Sonoran Desert National Monument protects 487,000 acres of the unique Sonoran desert landscape. 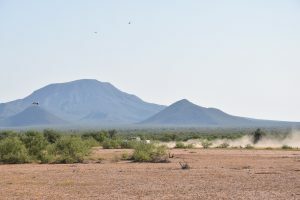 It is the hottest desert in Mexico, and we can confirm that it is also hot in Arizona. But what appears to be an expanse of dry and inhospitable space, is actually a diverse, rich and thriving ecosystem. 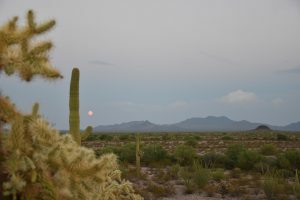 In fact, the Sonoran Desert has the most diversity of species of any desert in North America. 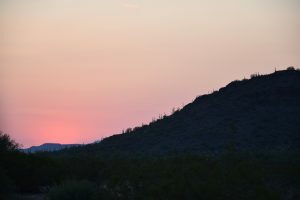 The Monument is home to desert bighorn sheep, mule deer, javelin, mountain lion, bobcat, endangered Sonoran pronghorn, over 200 species of birds, bat species, reptiles and amphibians. 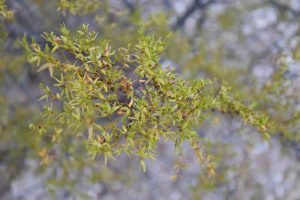 Plant species also abound, with leguminous trees, ironwood trees, paloverde trees, creosote bushes, prickly pear and cholla cacti. 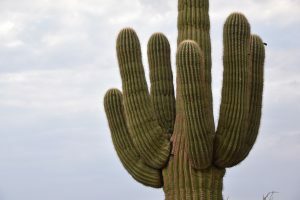 Perhaps most striking are the majestic saguaro cacti that punctuate the desert pan. 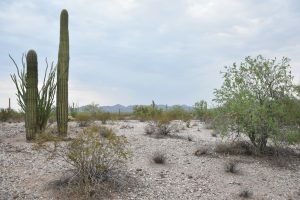 The Sonoran desert is the only place where the saguaro are native. 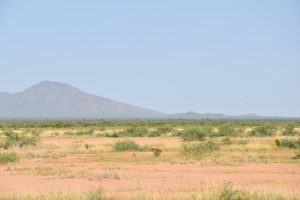 The desert floor is surrounded by three distinct mountain ranges which contribute to the variety of plant and animal life. 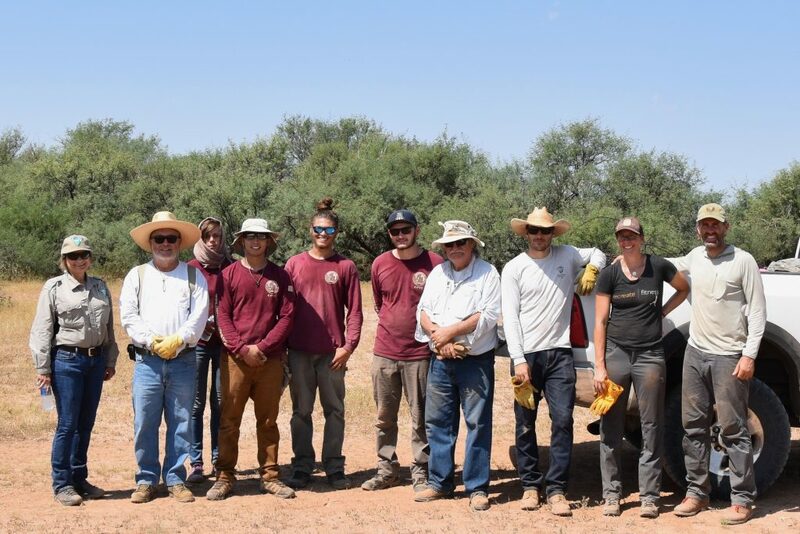 For our visit we met up with the Friends of Sonoran Desert, BLM rangers and BLM interns from American Conservation Experience (a conservation-minded volunteer corps) to fix cattle fences along the border of the Monument. 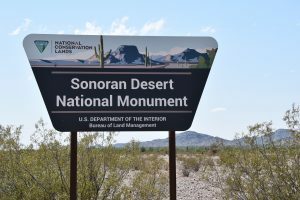 The Monument is unique in that the Proclamation identified grazing south of Interstate 8 as incompatible with the Monument objects (“monument objects” are those characteristics that are to be protected by designation) and required BLM to retire those grazing permits. 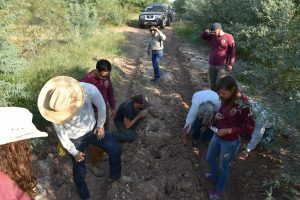 BLM was further directed to assess whether grazing permits north of Interstate 8 were compatible with the Monument objects and whether they should be renewed. 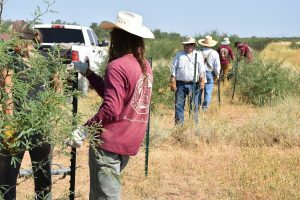 While grazing is not permitted in the area where we were working, the Tohono O’odham Nation, whose reservation borders the Monument, actively grazes cattle on their land and the cattle have been known to make their way into the Monument when they can find a way through the fence. We meet the group at 6 am and headed for the southeast fence line. Halfway there we pulled up to the BLM group out of their cars and looking at what appeared to be a 20’ section of muddy road. 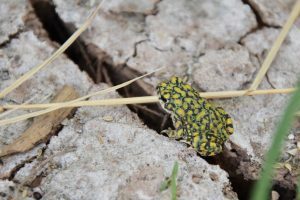 On further inspection, we found endangered toads and frogs had taken up residence in the puddles and were breeding. 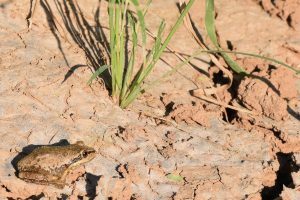 We saw dozens of tiny toads the size of a knuckle hopping around the mud. 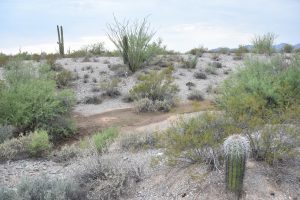 This was a rare moist section of the desert, a low place where water pooled, and thus habitat for the amphibians. 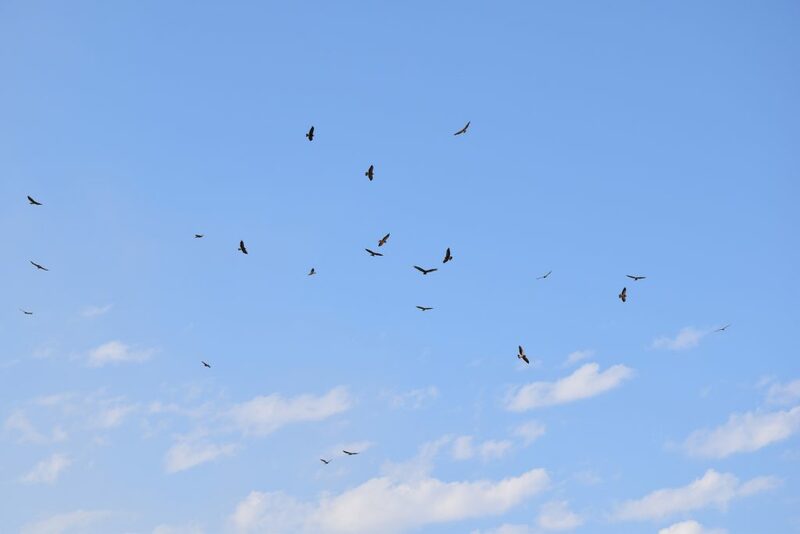 Further along we saw dozens of hawks and turkey vultures soaring together over something unseen. When we reached the fence, we drove alongside looking for areas in disrepair. 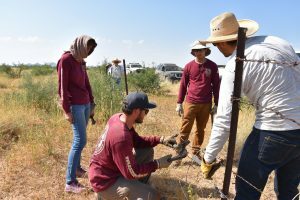 When we found downed or broken sections we would hop out, tighten the fence and/or put up new strands. 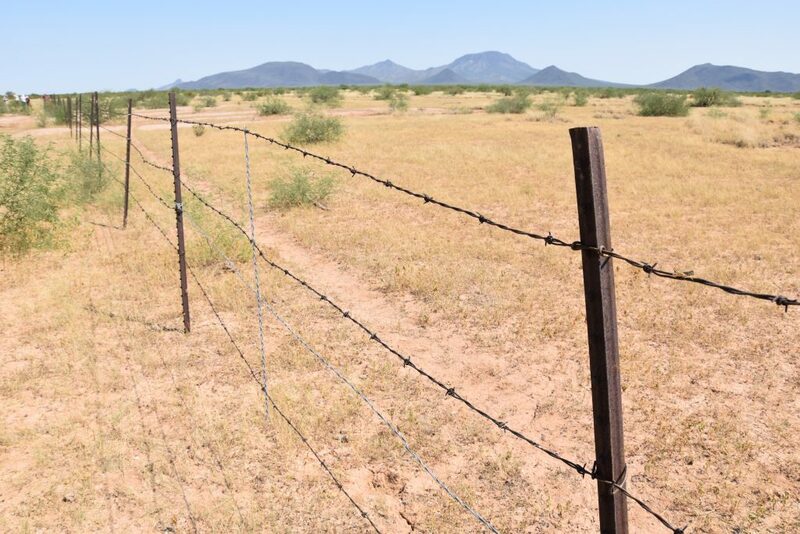 We’d also gather the old bent and rusted out fencing. As with every other place we’ve visited, the management is left to just a few individuals. 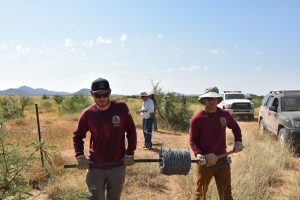 Groups like ACE are critical for maintaining access, maintenance, and monitoring these public lands. 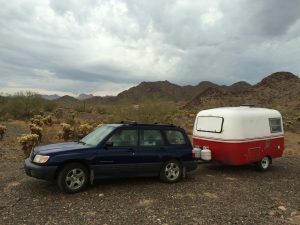 After fencing we retreated out of the sun and spent another night in the desert. The desert at night is especially beautiful. 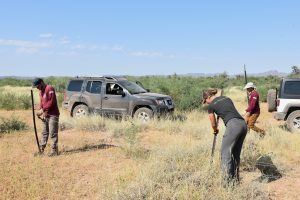 The Sonoran Desert is indeed very hot and dry, and as northwesterners we had to adjust our preconceived notions of what a vibrant ecosystem looks like. But, upon closer inspection the Sonoran Desert did not disappoint. 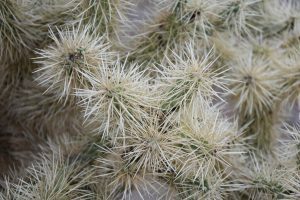 Experiencing the desert is like a treasure hunt, finding amazing and thriving ecosystems hidden throughout the landscape. 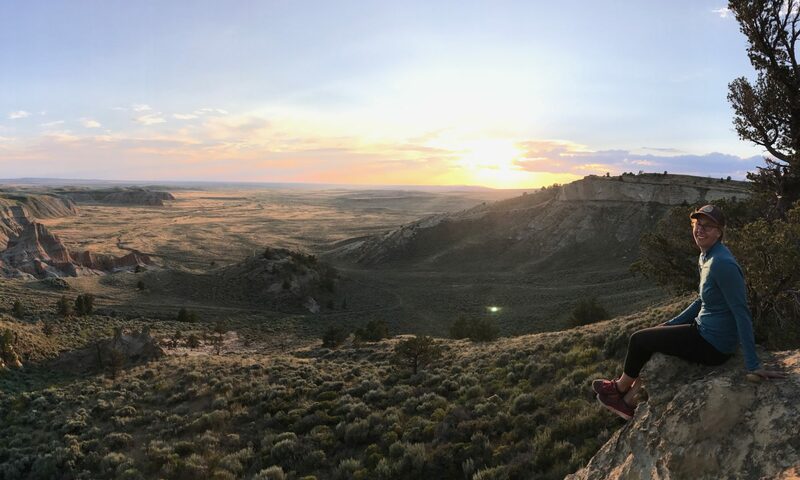 The Monument ensures that future generations will be able to experience and understand this unique arid landscape for themselves.